This is such a special time of year; it's the season for giving back to those in need and bringing joy to those we love. No one portrays that better than the winner of our "Warm Wishes" Giveaway: Elizabeth from Beavercreek! 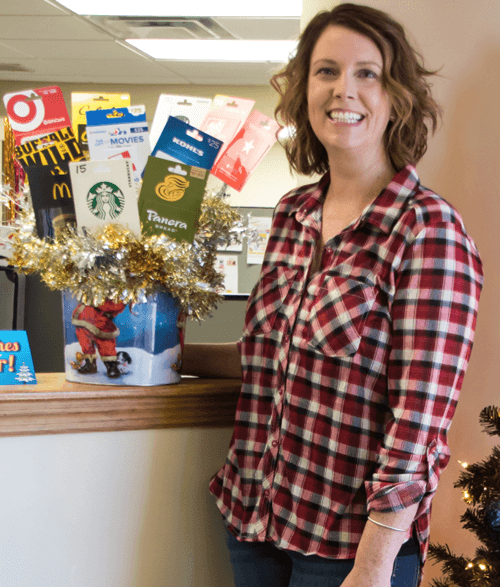 "If I won I would be giving this basket to a friend of mine and her family for the holidays. My friend has been battling cancer the past 4 years, and as a result, she is no longer able to work. Her not working and all of the medical bills has put a huge strain on the family financially. They don’t have many opportunities for anything extra as they are barely making ends meet with her husband's income. It would be nice to be able to surprise them with this gift basket for the holidays." Elizabeth picked up the gift basket at our office this morning and was so excited to take it straight to her friend. "Thank you and the entire Logan Services’ staff for helping me make a difference in someone else’s life today! My friend was absolutely surprised and overwhelmed w/ the gift basket. Her comment to me...'Now I can give our family a Christmas.' There were a lot of tears and but even more smiles at their home this afternoon! Thank you again!" We are thrilled to hear that this gift basket and Elizabeth's kindness helped bring holiday cheer to this local, deserving family. To thank her for being a customer and for allowing us the opportunity to bring joy to a home in need, we also surprised Elizabeth with a $100 VISA gift card for herself! Happy Holidays from your friends at Logan A/C & Heat Services!